May all Buddhas, world honored ones, worthy of offerings, with correct and universal knowledge, perfect in understanding and actions, passing from the world well liberated, supreme scholars, heroic tamers, teachers of gods and humans. Please listen, as I purify my heart. As I reflect on my unskillful nature. I practice to remove all ignorance, gain all wisdom, and attain complete awakening. May all Buddhas, world honored ones, please kindly think of me. If in this life or former lives throughout all my beginningless rounds of births and deaths, I have committed unskillful deeds myself, or told others to commit them, or condoned the committing of them. Such as taking things from stupas, from the Sangha, from the Sangha of the four directions. Either taking them myself, telling others to take them, or condoning its being taken. Or if I have committed the five offenses, which warrant uninterrupted retribution, or told others to commit them, or condoned the committing of them. Or if I have committed the ten unwholesome deeds myself, or instructed them, or condoned the committing of them. And all such obstructive offenses, whether hidden or apparent. Which should cause me to fall into the hells, hungry ghosts, animals or other unskillful destinies. Or cause me to live a mean, lowly, and wretched life. Of all such obstructive offenses, I now reflect with the intention to reform. May all Buddhas. world honored ones, now certify me and be mindful of me as I make the following statement in the presence of all Buddhas, world honored ones. If in this life or other lives, I have already practiced giving, or guarded the pure precepts, or even given as little as a morsel of food to an animal. Or gained good roots from bringing living beings to accomplishment, or gained good roots from cultivating Bodhi, or gained good roots from developing unsurpassed wisdom. If I have gained any throughout my entire life. I completely dedicate the merit, to all living beings realization, of complete and perfect Enlightenment. As all Buddhas of the past, present, and future dedicate such merit, so too do I dedicate such merit. As I reform all my offenses, and rejoice in the blessings of others. Seeking the wisdom of all Buddhas, I practice to realize the unsurpassed wisdom. To all Buddhas of the past, present, and future, the utmost supreme among living beings, a limitless sea of merit. I dedicate my practice, and bow in worship. Of all unskillful deeds which I have committed in the past, based on beginningless greed, anger, and delusion. And created by body, speech, and mind. I now reflect, with the intention to reform. Now that I have finished reflecting on my unskillful karma, I reaffirm my practice. 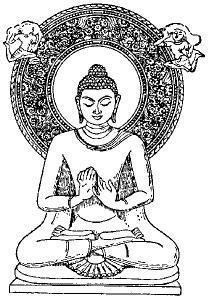 I take refuge in the Buddha. I take refuge in the Dharma. I take refuge in the Sangha. I undertake the practice, of not taking life. I undertake the practice, of not taking what is not given. I undertake the practice, of not indulging in improper sexual acts. I undertake the practice, of not speaking that which is untrue. I undertake the practice, of not consuming intoxicants. May I always be mindful of the path. May I always work toward the perfection of virtue, meditation and wisdom. May I always strive to use the skills of loving kindness, compassion, sympathetic joy, and equanimity, with all beings. In renewing my practice, may I always follow the examples of the Buddhas and Bodhisattvas, Arahants, and teachers of the Truth. Avalokitesvara Bodhisattva, when practicing deeply the Perfect Wisdom clearly saw that all five Skandhas are empty and passed beyond all suffering. Sariputra, all Dharmas are marked with emptiness: not born and not dying, not stained and not pure, not gaining and not losing. Therefore, in emptiness there is no form, no sensation, perception, volition or consciousness. No eye, ear, nose, tongue, body or mind; nor form, sound, smell, taste, touch, or Dharmas; no realm of sight til we come to no realm of consciousness; no ignorance and no ending of ignorance, til we come to no old age and death, and no ending of old age and death. No suffering, origination, extinction, or path. No wisdom, and no attainment, with nothing to attain. Because the Bodhisattva is the Perfect Wisdom of emptiness, his mind has no hindrance. Having no hindrance, there is no fear and far from all fantasy, he is dwelling in Nirvana. Because all Buddhas of the three times practice the wisdom of emptiness, they gain complete and perfect enlightenment. ......happy, peaceful and free from suffering. By the power of Truth found in the Buddha Dharma, may all my misfortunes due to stars, demons, harmful spirits, and ominous planets, be prevented and destroyed. May the rain fall in due time. May there be a rich harvest. May the world be prosperous. May the governments by righteous. By the power of all the fully-awakened Buddhas, by the power of all the fully-awakened Pacceka-Buddhas, by the power of all the fully-awakened Arahants, by the power of all the fully-awakened Bodhisattvas, may I be secure and protected in every way. I have not gone beyond decay. I have not gone beyond disease. I have not gone beyond death. I was born of my karma. I am dependent on my karma. I will die because of my karma. The results will be mine. How painful it is, to be born again and again. Youll not build this house again. The rafters are being broken. The ridge-pole is being shattered. The thirst is being quenched. The unconditioned is being realized.